1. 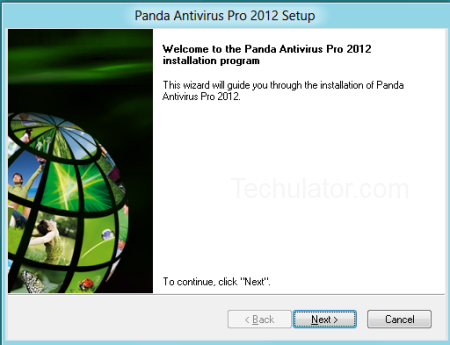 Panda Antivirus Pro 2012 is free only until the final release date of Windows 8. You can install it on your Windows 8 consumer preview currently to protect it from malware and virus, but you may have to go for an upgraded, paid subscription for the final release of Windows 8. 2. Panda Antivirus Pro 2012 is currently under beta and so company wouldn't give any guarantee on the product. It is expected that the product would work just fine, but just like any other beta programs, this free antivirus for Windows 8 could have bugs and other issues. Operating Systems: Windows 8 32-bit and 64-bit. You can download the free Antivirus for Windows 8 from Panda Antivirus for Windows 8. Depending on your internet speed, it may take 1 or 2 minutes to complete the download. Installation is pretty straight forward. You can follow the installation wizard with default selections and complete the installation in few minutes. At the end of the installation, you can open the Panda Antivirus control panel and configure various settings. When you open it first time, you may be prompted to download and install the latest updates of your virus definitions. If you are installing Panda Antivirus 2012 beta on Windows 8, you might get a warning from Windows Firewall prompting you to allow or block the Panda features. You may trust and enable Panda to access the restricted Windows resources. During the first use, you will be prompted to activate your Panda antivirus. Even though this software is free, you still need to activate it. The activate process is easy and pretty straight forward. The activation wizard will guide you through the process. All you have to do is, provide your email address and proceed through the wizard. I downloaded and installed the Panda Antivirus Pro 2012 and the whole process took only few minutes, even though I had to spend sometime to figure out how to do various things in Windows 8. The whole process was easy and smooth. Downloading Panda Antivirus Pro 2012 is easy and quick. You do not need to even provide your email id or register in their site to download the antivirus. The installer is pretty small. The whole download took only 2 minutes. Installation is easy and straight forward. You can proceed through the wizard selecting the default options. You can get up and running in few minutes. No need to do any complex configuration. No confusing questions that require expert consulting to find answers. Does not cause any big overload to your computer and CPU. Can run parallely with other CPU intensive programs without causing any significant overload to CPU. Intuitive user interface and simple navigation. Links to help topics and relevant resources wherever needed, making it easy to find answers to any questions.